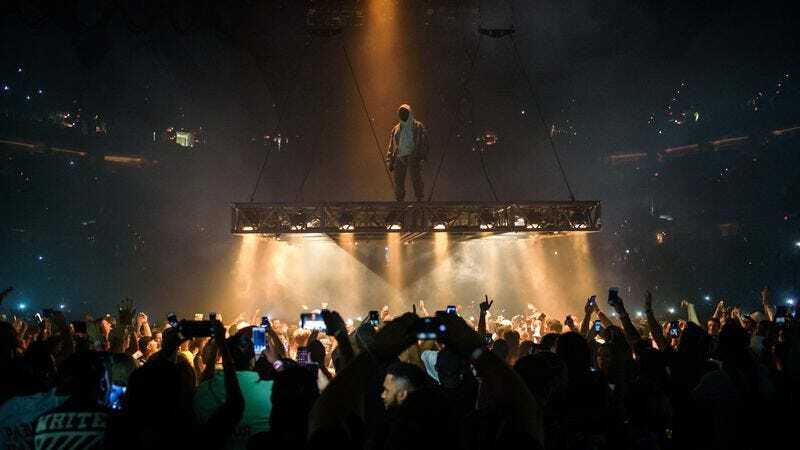 Kanye West has added a new, 23-stop leg to his ongoing Saint Pablo Tour, a high-flying spectacle that’s seen the rapper forgo a more traditional stage in favor of performing from a floating platform that hovers above the watching crowd. And—barring the occasional would-be hanger-on—it seems like the unlikely new presentation has been a remarkable success, drawing strong praise from outlets like The New York Times and Rolling Stone. Now, Yeezy fans in San Jose, Dallas, and a number of other North American cities will be able to watch their musical hero float hither-and-yon. Meanwhile, West’s The Life Of Pablo continues to be a major hit even eight months after its release; one of the album’s singles, “Father Stretch My Hands Pt. 1”, is currently the top charting track on Urban Radio, beating out songs by Usher and Chance The Rapper.